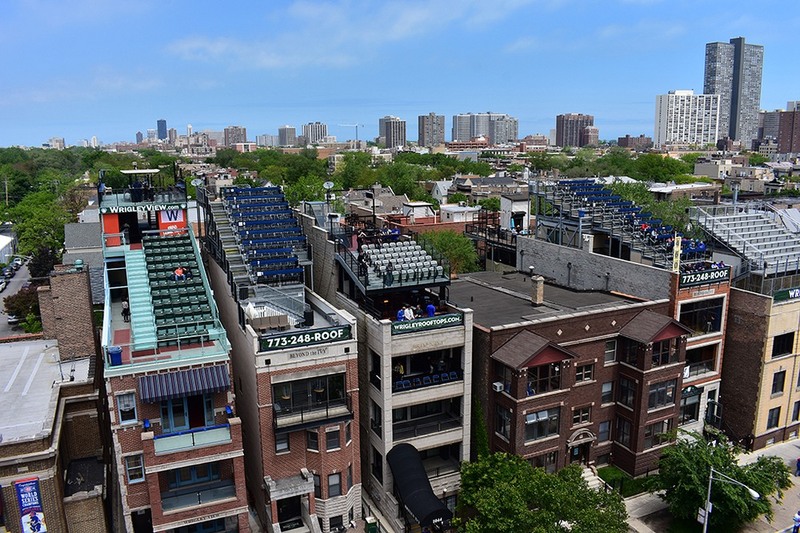 One of the best spots to watch the Chicago Cubs play at their home ground, Wrigley Field, is not inside but outside the stadium, from the rooftops of the neighboring buildings. Sounds odd, but these rooftop seats are in big demand—sometimes more than the seats inside the stadium. Wrigley Field on the North Side of Chicago is one of Major League Baseball’s historic stadiums. 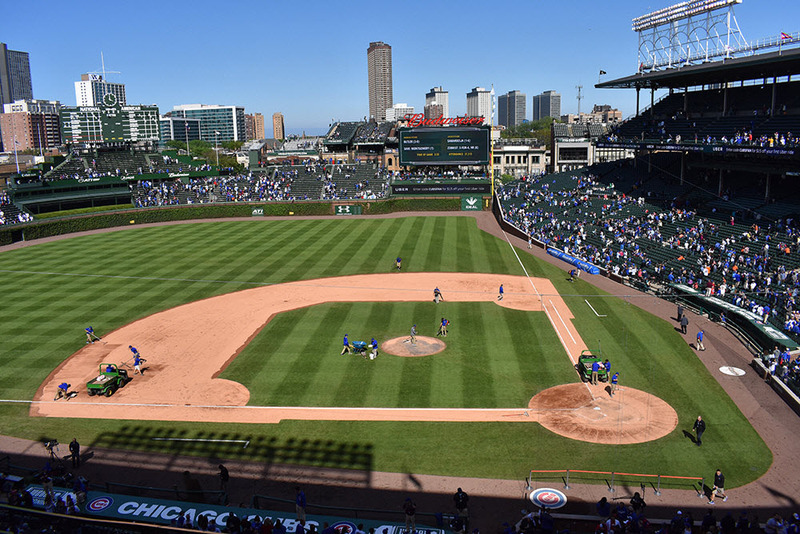 It first opened in 1914 for a baseball team called Chicago Whales, but since 1916, it has been home to the Chicago Cubs. 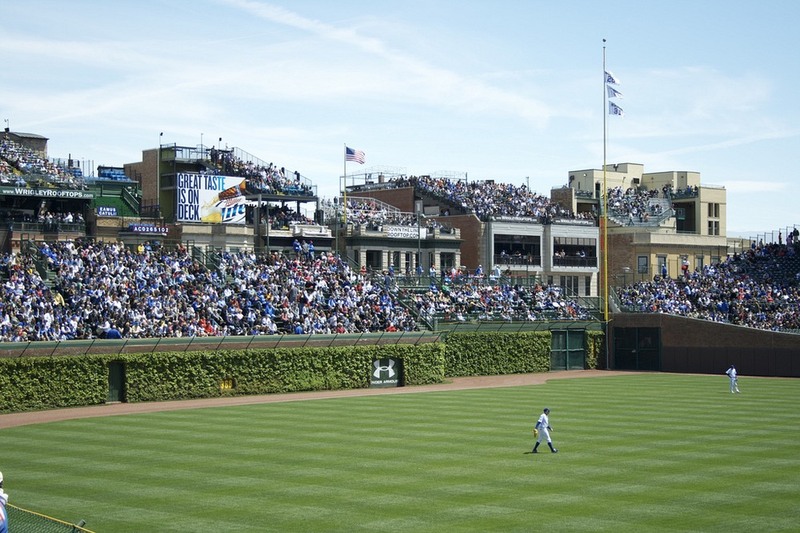 Wrigley Field was built inside the city on a plot that is surrounded by multistory apartment buildings. From the rooftops of these buildings across the streets, one can have a clear view of the playing arena, so it was not uncommon for the residents to invite their friends over whenever there was a game. Folding chairs were laid out on the roof, chilled beer handed out and barbecues were fired up. Over time these neighboring rooftops became informal gathering spots for fans who wanted to enjoy free viewings. The rooftops became a popular spectator area during the 1929 World Series, and then again during the 1938 World Series. It was during the latter tournament, that some enterprising residents began to charge small access fees to the rooftops. Still, it was no more than a few dozen people who sat in lawn chairs and brought their own food and beverages. It wasn’t until the 1980s, that the practice morphed into a big business. Over the next two decades, businesses and entrepreneurs snatched up the old buildings and rebuilt them into multilevel complexes. Apartment floors were converted into eating areas with incredible sports-bar and clubhouse ambiance, outdoor patios and flat-screen TVs. On rooftops, lawns chairs gave way to multi-level bleachers. In late 1984, when the Cubs were playing against San Diego, tickets were hard to come and the rooftops overflowed with spectators. TV cameras continually panned towards the teeming rooftops and even the announcers loved the sights of these informal appendages. Everyone adored the images, everyone except the Cubs. 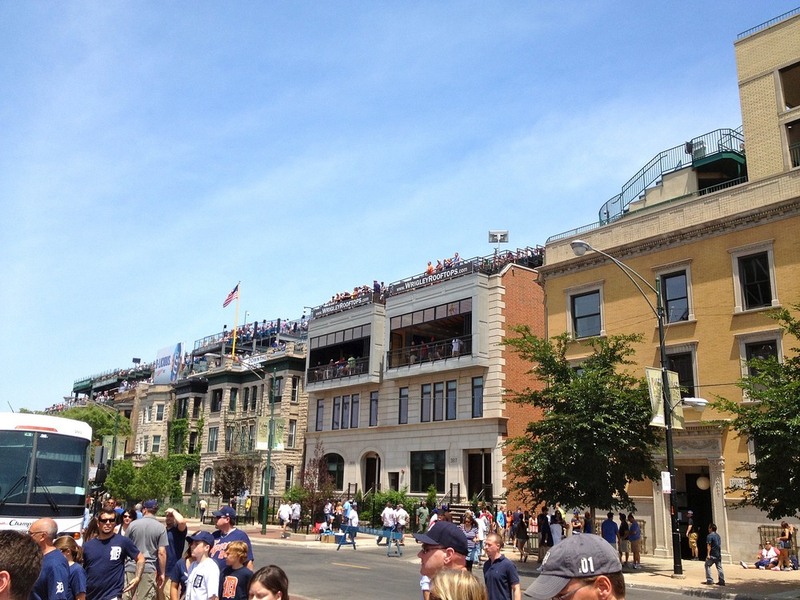 The Cubs management saw these rooftop stands an act that was analogous to piracy. At first they tried to obstruct the view of the field from the rooftops by erecting a wind screen. Putting up a tall spite fence was also discussed. A similar problem troubled the Philadelphia Athletics of the American League at Shibe Park during the 1930s, when homeowners had a great view of the proceedings from their bedroom windows and porches. Shibe Park then erected a tall corrugated metal structure to block the views. Such an option was considered by the Cubs but not pursued. Finally they decided to go legal and sued the rooftop owners in 2002. One year later, the owners settled out of court and agreed to pay the Cubs 17 percent of their gross revenue for the next twenty years. 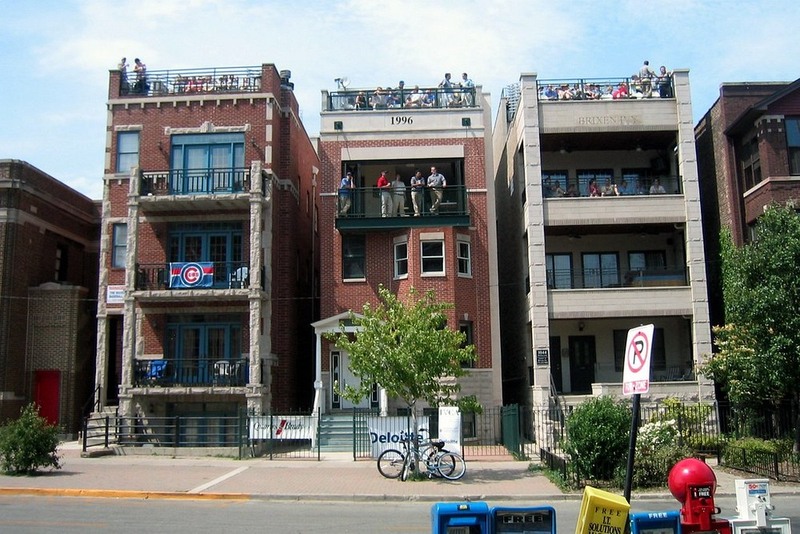 In exchange, the Cubs began to endorse the rooftop seating as their official rooftop partners. A period of boom followed. Many rooftop owners borrowed millions of dollars to upgrade their buildings into what the New York Times called “vessels of luxury”. 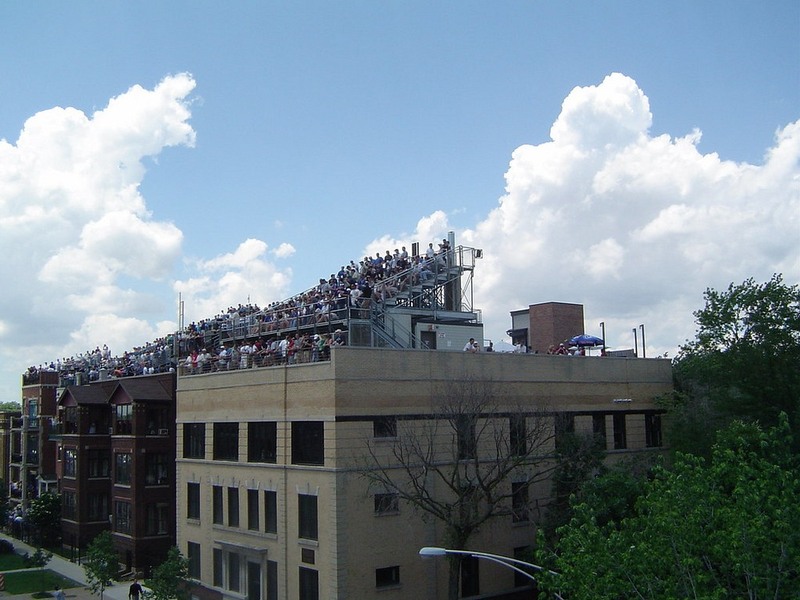 In 2009, Thomas S. Ricketts, the current owner of the Cubs, purchased the team and immediately offered to buy all the rooftop businesses. The owners resisted, and even sued him back for breaching the contract when Ricketts revealed plans to renovate the stadium with a substantial expansion and a new roof that would obstruct the rooftop views. Then came the recession. As many rooftop owners scrambled to make payments on multimillion-dollar mortgages against dipping revenues, selling off to the Ricketts looked like a particularly attractive offer. One by one, the owners relented. Today, the Ricketts family own eleven of the sixteen Wrigley Rooftops. 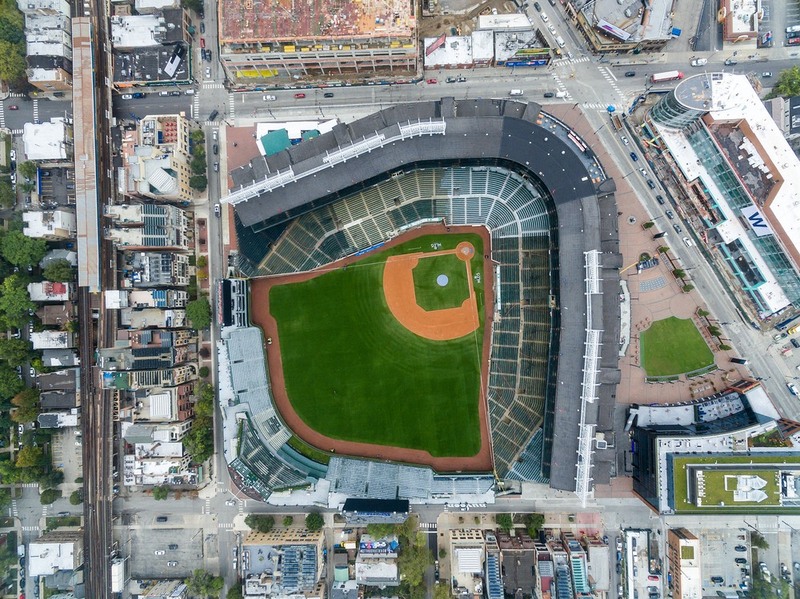 These sixteen buildings surrounding Wrigley Field on the two outfield sides share among themselves over 3,000 seats. The stadium itself has a seating capacity of 42,000.